Camp Able is for individuals age 9 and up with special needs. 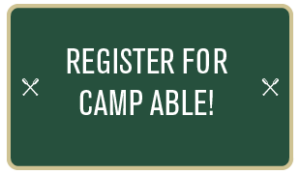 Camp Able is specifically designed for persons with special needs. It is not about disabilities, but rather about abilities! Christ has called us to love God and to love our neighbor as He has loved us – without conditions or limits – it is in celebration of that perfect love that we come together at Camp Able. In this setting we are reminded that our neighbors don’t all look, or sound, or think the same way we do. Camp Able is about forming a community that loves us just as we are. It is about attempting to emulate that perfect love God has for all of His children. Our goal at Camp Able is to establish, at least for a few days, a community of unconditional love, compassion and acceptance. During Camp Able, the campers take part in several different activities i.e. swimming, arts and crafts, talent night, and much, much more. What is not easily expressed through words can be read on the camper’s faces—filled with amusement and delight. Each camper, faced with their own set of circumstances, work through their challenges to take part in a camp that allows them to have fun, learn new things, and most importantly, just be an ordinary person. The cost for this camp session is $400 per camper and includes registration, meals, canteen, milk and cookies, camp t-shirt, and camp picture.